The Tower at Dubai Creek Harbour ... set on piles tested to a world record test load. Work has started on the anchorages for the stay cable supports of The Tower at Dubai Creek Harbour, following the completion of the foundation work on the iconic observation tower in a record time. More than 145 barrette piles have been laid to depths of over 72 m to secure the super-tall structure being built by the leading UAE-based developer Emaar. The barrette piles used for the foundation have been tested to a world record test load of 360 MN (36,000 tonnes), and the work was undertaken by foundation specialist, Soletanche Bachy. A cathodic protection system, similar to that used on the foundations of Burj Khalifa, is being completed to protect it from any corrosion risk. With work on the 19-m pile cap commencing shortly, The Tower at Dubai Creek Harbour will witness a global team of professionals working to create another stunning icon. A joint venture with Dubai Holding, Dubai Creek Harbour is a waterfront city that will define the ambitious new face of Dubai’s future, according to Emaar. The 6-sq-km Dubai Creek Harbour sits by the Dubai Creek, overlooking the Downtown Dubai skyline and is near the Ras Al Khor Wildlife Sanctuary, a biologically diverse wetland reserve and home to over 67 species of water birds, protected under the Unesco Ramsar Convention. 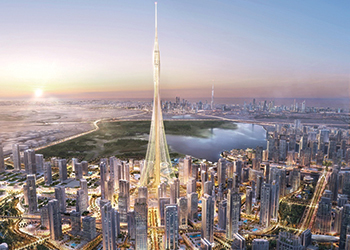 Designed by Spanish/Swiss architect and engineer Santiago Calatrava Valls, The Tower will feature several observation decks that offer 360-degree views of the city and beyond, said Emaar. Among the highlights are The Pinnacle Room and VIP Observation Garden Decks that recreate the splendour of the ‘Hanging Gardens of Babylon,’ one of the Seven Wonders of the Ancient World, it stated. The Tower is also linked to a Retail District, one of the largest in the world. The Tower adds great economic value to Dubai Creek Harbour where Emaar has unveiled exceptional residential projects including Creek Gate, Harbour Gate, The Cove, Dubai Creek Residences, Creekside 18, Harbour Views, and Creek Horizon. HH Sheikh Mohammed bin Rashid Al Maktoum, UAE Vice President and Prime Minister and Ruler of Dubai, recently reviewed the progress at The Tower at Dubai Creek Harbour site. He was accompanied on the tour by Mohamed Alabbar, the chairman of Emaar Properties; Abdullah Al Habbai, the chairman of Dubai Holding, and other senior officials. Last October, Sheikh Mohammed marked the ground-breaking of the tower.